American general Douglas MacArthur attained widespread fame through his military activities in the Pacific region during World War II (1939–45) and the Korean War (1950–53). His military conquests were sometimes inspiring and other times highly criticized. Regardless, MacArthur remains the key figure in the American victory in the Pacific during World War II. Douglas MacArthur was born in Little Rock, Arkansas, on January 26, 1880, the descendant of a long line of military men. His father, Arthur MacArthur, was a well-known general. Educated in a random fashion on the rugged Western frontier posts, Douglas MacArthur recalled, "I learned to ride and shoot even before I could read or write." MacArthur graduated first in his class in 1903 with the highest scholastic average at the academy in twenty-five years. After graduation from the academy, MacArthur sailed to the Philippines for his first military assignment. In 1904 he was promoted to first lieutenant, and that October was ordered to become his father's aide-de-camp (secretary) in Japan. Shortly thereafter he embarked upon a tour of the Far East, which he later called the "most important preparation of my entire life." Returning to the United States, MacArthur began his fast rise through the military ranks. In 1906 he was appointed aidede-camp to President Theodore Roosevelt (1858–1919) and in 1913 became a member of the general staff. He was appointed colonel of the Rainbow Division during World War I (1914–18), or the Great War, in which European powers, along with America and Russia, waged war over control of Europe. 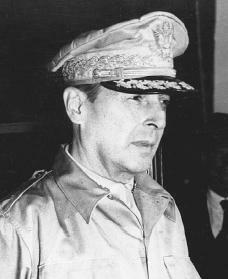 MacArthur emerged as a talented and colorful military leader. He returned from combat with many military honors. Following the war, he became a brigadier general and superintendent of West Point, where he remained until 1922. After another assignment in the Philippines, MacArthur was appointed chief of staff of the U.S. Army in 1930, a post he held through 1935. The years between World War I and World War II were frustrating ones for professional soldiers, and MacArthur was no exception. In 1922 he married Louise Cromwell Brooks and divorced her in 1929. Soon afterward, the national economy bottomed out during the 1930s, as the Great Depression (a period from 1929 to 1939 during which nearly half the industrial workers in the country lost their jobs) consumed America. Gloomy about the social unrest of the 1930s, he warned a Pittsburgh, Pennsylvania, audience in 1932 about the presence of Communists (people who believed in communism, a political system in which goods and property are owned by the government). At a time of great uncertainty, MacArthur was able to stir fears that Communists were living in America. In June 1932 thousands of ragged veterans of World War I marched on Washington, D.C., to petition Congress for early payment of their war service bonuses. Camped with their wives and children, they were set upon by tanks, four troops of cavalry with drawn swords, and steel-helmeted infantry with fixed bayonets—all led by MacArthur. He argued that his actions narrowly prevented a Communist revolution. This would not be the last time MacArthur would favor extreme measures of force. In 1935 MacArthur went back to military service when President Franklin Roosevelt (1882–1945) sent him to the Philippines to develop a defensive strategy for the islands. Only two years later, he married Jean Marie Faircloth and retired from the U.S. Army in 1937. His retirement would not last, though. With the heightening crisis in Asia, he was recalled to active duty as a lieutenant general and commander of U.S. forces in the Far East in July 1941. Despite advance warning, the Japanese invasion of December 1941 badly defeated MacArthur's forces in the Philippines. MacArthur was determined to hold the Philippines but the situation was hopeless. He was ordered to withdraw to Australia to take command of Pacific operations. Reluctantly, MacArthur agreed, and accompanied by his wife and child he set out on a daring escape by patrol torpedo (PT) boat, a small, lightweight craft. Discouraged by the American defeat, he announced upon arrival, "I came through and I shall return." After the Philippine defeat, MacArthur began the long campaign to smash Japanese military power in the Pacific during World War II. Slowed in the early months by shortages of men and supplies, MacArthur's forces eventually won major victories. Although his personal responsibility for the battles was exaggerated by the skillful news management of his staff, there can be little question of the general's success in New Guinea and in the Philippines. In 1944 MacArthur convinced President Roosevelt that an invasion of the Philippines was necessary to ensure victory in the Pacific. In October 1944 MacArthur waded onto the invasion beach at Leyte and delivered his prepared address into a waiting microphone: "People of the Philippines: I have returned.… Rally to me." For MacArthur, as for millions of Americans, it was an inspiring moment, possibly even more inspiring than his acceptance of the Japanese surrender at Tokyo Bay on September 2, 1945. With the end of World War II, President Harry Truman (1884–1972) appointed MacArthur supreme commander of the Allied powers in Japan. During this appointment, MacArthur successfully reduced Japan's military, helped restore the Japanese economy, and advanced religious freedoms and civil liberties in postwar Japan. The outbreak of the Korean War, in which American-led forces aided South Korea in their fight against Communist North Korea, resulted in MacArthur's appointment as commander of the United Nations (UN) forces. In the first months of combat, MacArthur launched a brilliant attack at Inchon that severely hurt the North Korean armies. MacArthur then advanced his troops to the Yalu River, the boundary between North Korea and China. Failing to consider the possibility of a Chinese attack, he assured his troops that they would be home in time for Christmas dinner. In November, however, massive Chinese armies sent the UN forces into retreat. Angered and embarassed, MacArthur publicly called for the extension of the war to China. President Truman, who wanted to limit American involvement in the East, had repeatedly warned MacArthur not to express his own ideas of the war to the public. Truman finally relieved the general of his command in April 1951. MacArthur's return to the United States was greeted by massive public expressions of support for the general and criticisms from the president. On April 19, 1951, he presented his case to a joint session of Congress, attracting a tremendous radio and television audience. His speech ended on a note that stirred millions of Americans: "I now close my military career and just fade away." MacArthur became more active than he had predicted. He testified at great length before the Senate Armed Services and Foreign Relations committees. Then he traveled across the country criticizing the Truman administration, insisting they had sold out Asia to communism. In December 1952 President-elect Dwight Eisenhower (1890–1969) met with MacArthur to hear the general's views on ending the Korean War. MacArthur supported a peace conference that, if unsuccessful, would be followed by "the atomic bombing of enemy military concentrations and installations in North Korea." MacArthur also called for military action to overthrow Communist China. As a result, MacArthur was not consulted again. MacArthur then retreated to a life of out of the public eye. A soldier to the end, he died in the army's Walter Reed Hospital on April 5, 1964. His wife, Jean, died on January 22, 2000, at the age of 101. Although controversial throughout much of his career, MacArthur is remembered as one of America's great military leaders. Finkelstein, Norman H. The Emperor General: A Biography of Douglas MacArthur. Minneapolis: Dillon Press, 1989. Manchester, William. American Caesar, Douglas MacArthur, 1880–1964. Boston: Little, Brown, 1978. 7 October 2017: An excellent but incompete bio. The General made one important contribution to the Second World War that is always ovelooked. This contribution to winning WW II was greater than the impact of both Atomic Bombs. Jim D.